– Children feel safe, secure and happy within a caring ethos and climate of mutual trust which values all members of the school and encourages a pride in personal contribution. – Children are treated as individuals and are allowed to progress at their own level in a stimulating environment to develop to their maximum potential. – Children are challenged, encouraged to experiment and to learn through first hand experience. – There is no fear of failure. We promote high expectations, high standards, and seek to provide children with quality experiences and a quality environment in which to work. We offer opportunities for children to make choices, take decisions and express their own points of view fluently. Children are encouraged to be independent learners, but are also offered opportunities to learn with others and develop enquiring minds. Each individual is respected and their diversity of background is welcomed and highly values. Christian values are promoted, alongside tolerance and understanding of other religions and ways of life. 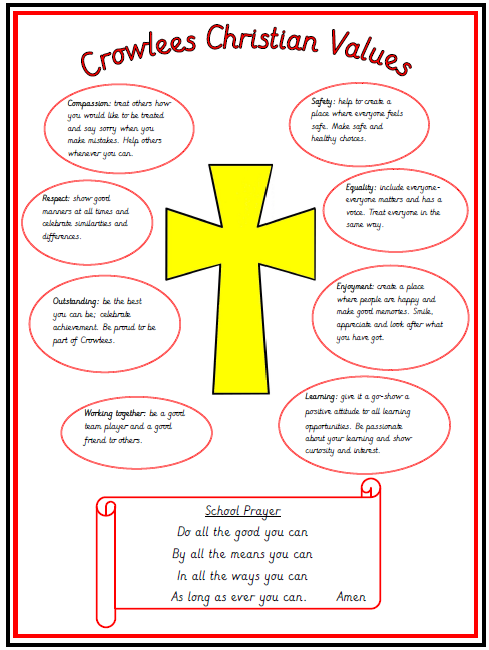 Close links are established with St Mary’s Church and we encourage children to grow spiritually, morally and intellectually within a Christian environment through worship and the everyday life of the school. Individuals develop a positive self-image, increase their self-esteem and are encouraged to succeed.